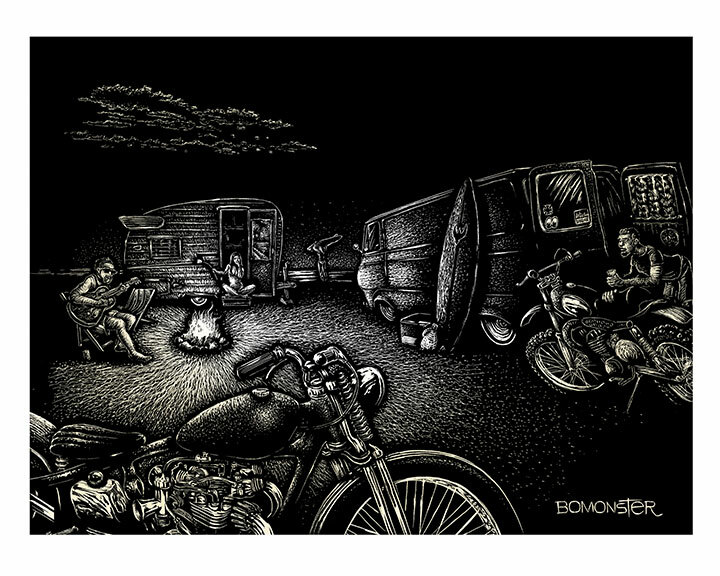 BOMONSTER is a Southern California scratchboard artist inspired by the hot rod/motorcycle/off-road/beach culture of independence, freedom and good times. His unique designs are scratched with a knife on a black-inked board to reveal the slightly twisted image just beneath the surface. “I grew up in the So-Cal suburbs watching my dad build race cars at night and drag race on weekends. My friends and I all were into skateboards, BMX bikes, and dirt bikes. 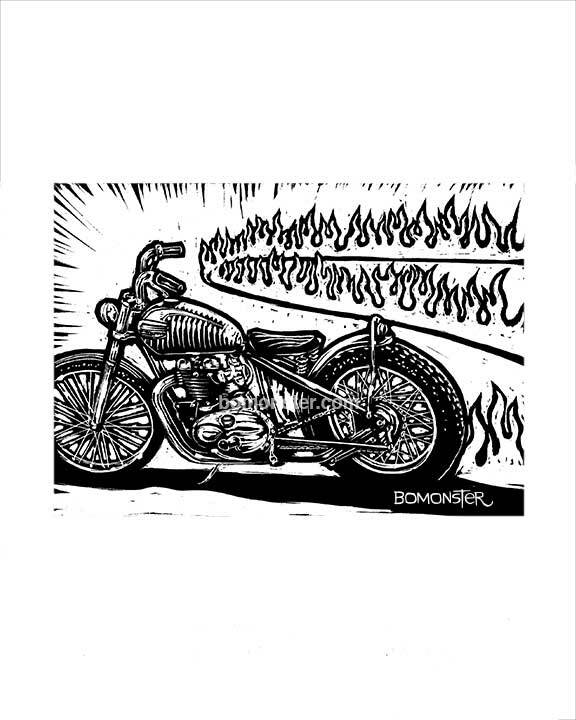 I met Ed “Big Daddy” Roth as a kid through my dad’s business and remember how his hot rod monster art captured the emotional spirit of those days like nothing else. 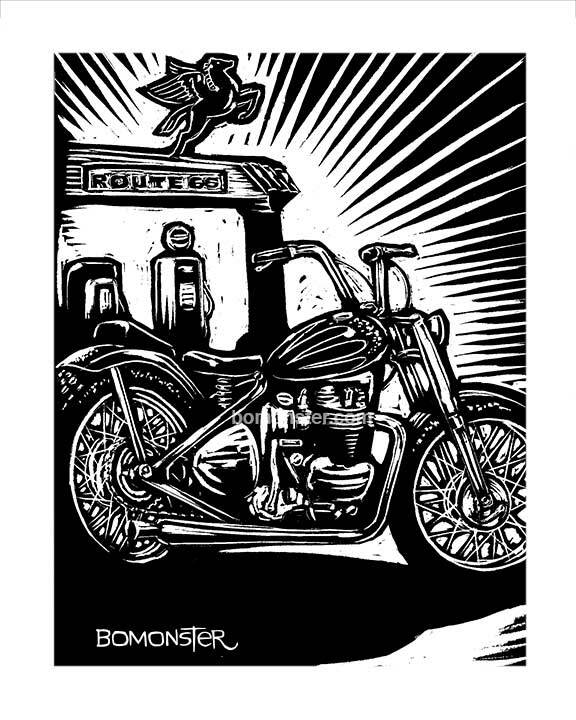 We still live in a creative and fun time, and I try and tap into that same spirit of originality with my own art” says BOMONSTER. 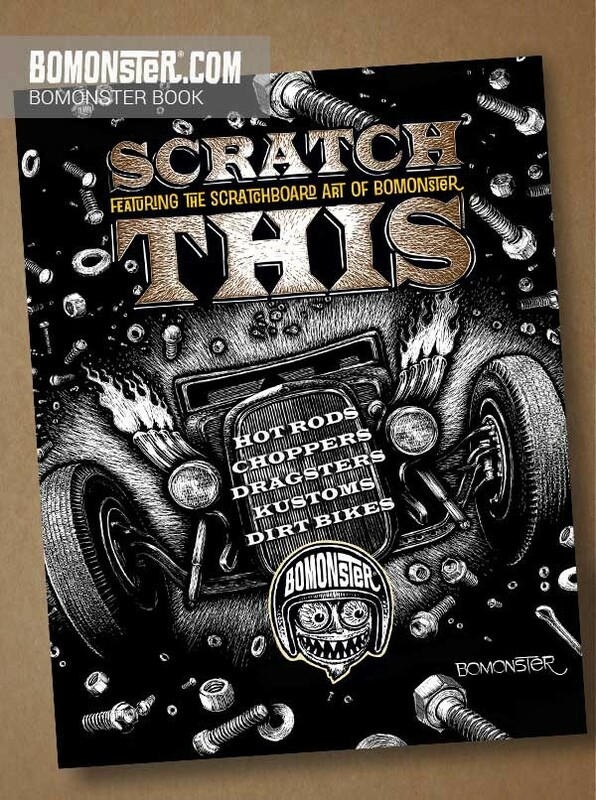 What are the tools you use for your scratchboard art, and can you give people a quick idea of what scratchboard art is? 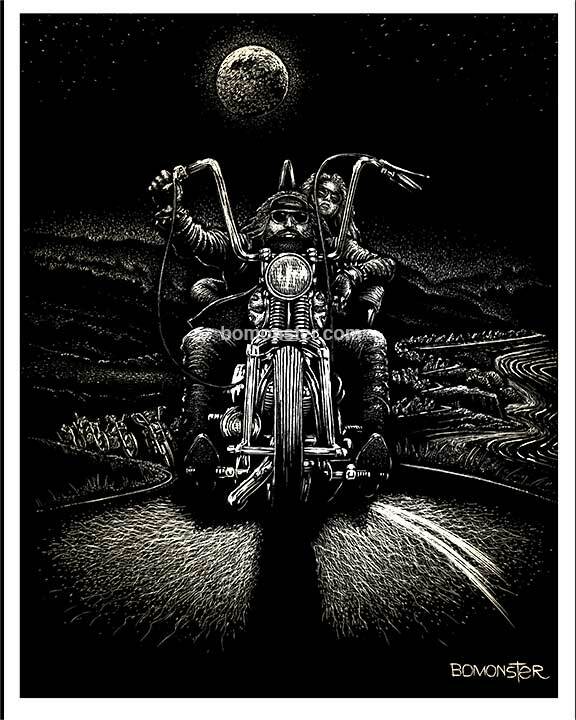 Scratchboard is the art of drawing with a knife. The board is about the thickness of Masonite. There is white undercoating with black ink applied to the surface. I use a #16 X-Acto blade to scrape the black off, revealing the white underneath. If you make a mistake on a scratchboard can you paint over the mistake with black ink in order to do a re-scratch? Yes, I can fix small errors that way — or scratch big flames to cover the mistake but usually it means starting over. That’s why I treat every piece like a tattoo. I spend a lot of time designing the piece and then transfer just the outline shape to the board for scratching and fill in the details as I go. I used to fear to have to do a piece over again, but while reading an Ed Hopper book, I realized old masters would pre-paint a piece before completing the masterpieces we see today in the books and museums. And their pre-paintings were spectacular so it hit me if that’s the way the old timers did it then I should too. Now I plan to do every piece twice. If I nail it on the first one, it’s a bonus. Not counting the reference research and sketching time, how long does it take -on average- to finalize a scratch project? One very long night for a 12x16 size board. And then I give it the overnight test see it with fresh eyes and add another hour or so. Larger 18x24 pieces can take two very long nights. Can you talk about your art background? Formally trained or self-taught? I was the guy in high school who drew cartoons for the school paper. I got into advertising and used my drawing skills to illustrate rough ad ideas and TV concepts. Once the designs were approved, we hired real artists to illustrate them — which didn’t really allow me to develop my art chops to a high degree. But directors and photographers liked shooting my stuff because of the ideas, composition, and design of my thoughts. Six years ago I went back to a medium I remember loving in high school art class: scratchboard. 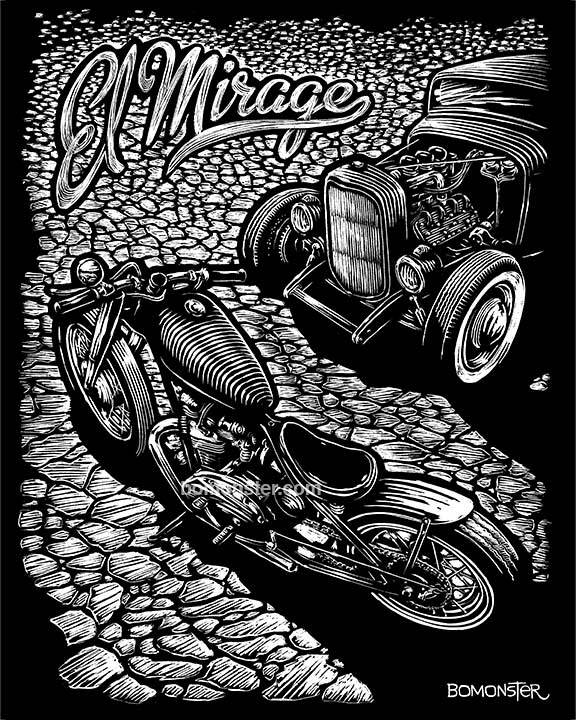 I scratched some hot rods and bikes and showed them on hot rod forums. Other artists got excited for me and pushed me into making some prints and shirts to sell. Their enthusiasm psyched me up to be a better artist, so I poured myself into making more. How did your early years watching your dad build race cars and seeing all of those racers influence you as an artist? My dad’s race car and dirt bike racing buddies were all super nice guys and great to kids who showed an interest. There were all different personality types and skill levels, but I recognized early on that they all had one thing in common: they loved the fun of it. All the things I enjoyed — the sights, sounds, smells and feel of speed — they loved too. 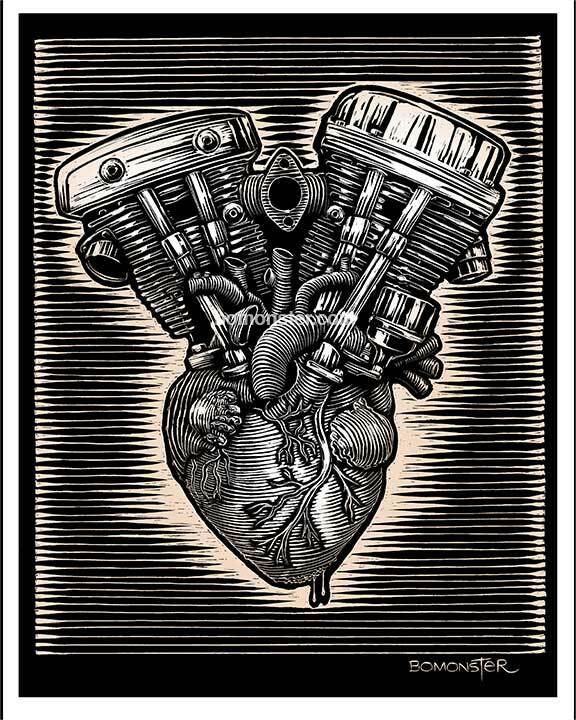 So my art isn’t about a “thing” like a specific car or bike, but more about a “feeling” being around cars and bikes. You’ve done commercial artwork for clients such as Porsche, Apple, Acura, Yamaha, and Nissan. What was that like? Did you work on anything that we would be recognizably BOMONSTER? Every one of those clients was different in some way, but they all wanted great work and had the budget to do things right. Great job at that level is a team effort, and I love working with so many talented people. Making art is mostly a solitary effort, and while I sometimes miss the interaction, I also like creating art that pleases me without other people weighing in on what they would do differently. 99% of my work for those clients ends up in the form of polished contemporary film or modern, slick graphic design whereas my art has a grittier, more organic “old school” feel. 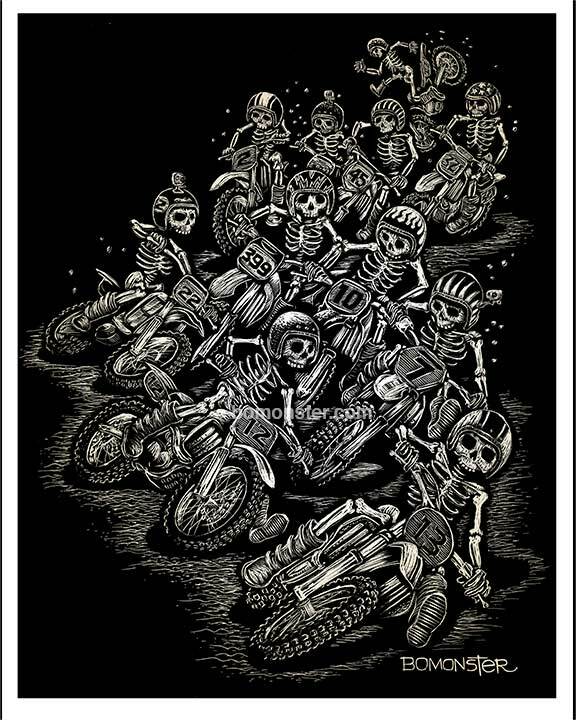 In looking at your artwork, I see two other artists: MC Escher and VCJ (Vernon Courtland Johnson, of Powell Peralta skateboard graphics fame). Have they influenced your work at all, or do you guys drink from the same super awesome water fountain? Obviously, my “Self Reflection” piece is a direct lift from M.C. Escher, but I like his ability to bend minds and use surrealism to create a feeling. 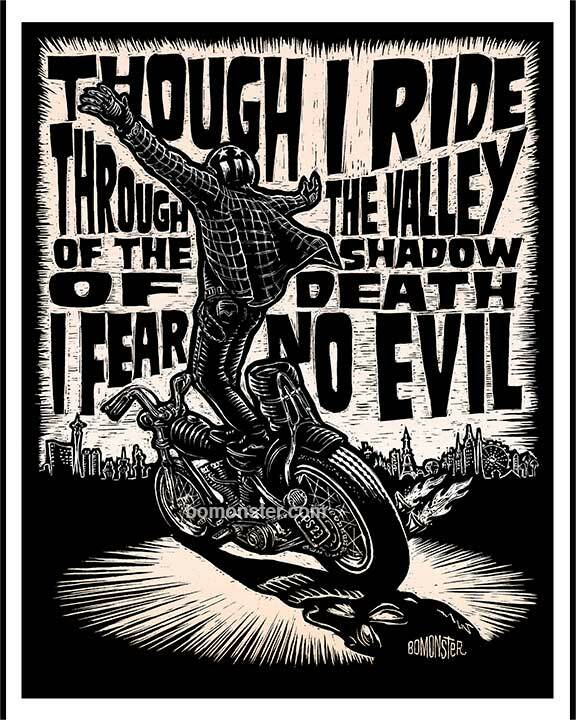 Court’s work for Powell Peralta defined 80s skate culture, and his iconic imagery still influences lowbrow art culture nearly 30 years later. 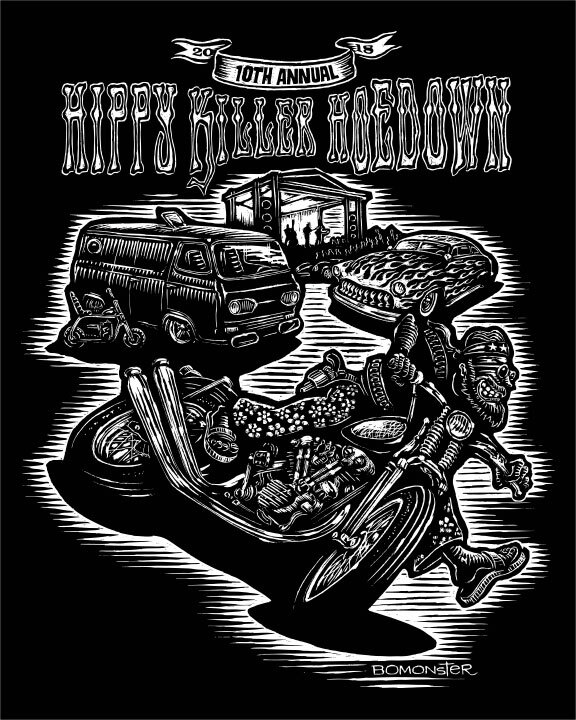 I also like Jim Phillip’s skate deck and rock poster art from those years and artists like Rick Griffin, Ed Newton, Robert Crumb, Mad magazine’s Don Martin and Basil Wolverton before them. Everyone we’ve mentioned could simplify the image and create such a cool vibe that suggests a bigger story. Rather than copy what those guys did I’m trying to be inspired by their style and put it in today’s context. What are sales like on your site compared to going on the road and selling? You’ve gone on, what, ten shows in the month we’ve been talking about this magazine feature. Do you love traveling, or is that just the best way to get your artwork seen by the like-minded masses? Both require a tremendous amount of effort. Just having a website is not enough. You have to get people to see it, and that means you need to be involved in social media. My website sales are best when I’m engaged on Facebook, Instagram, and my blogging. Art is not the easiest thing to sell because it’s not a rational decision — it’s an emotional one. I see things I like online all the time and then get distracted and forget to buy. And that’s the great thing about live shows — the music, the cars, the creativity, the people — all create an environment where the art fits. I look for shows that I enjoy as a fan — not just as a vendor. 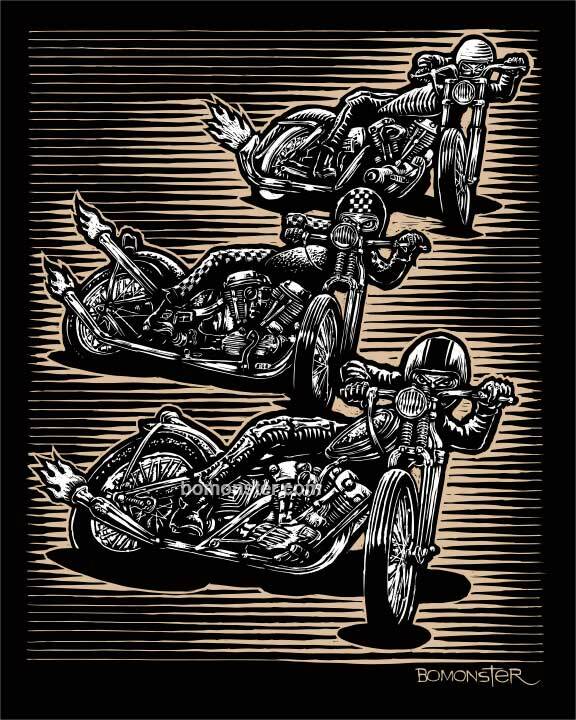 I’ve done art gallery openings, music events, car and bike shows, drag racing events and a couple of big AMA MX races. The art purchase becomes more of an emotional reaction to the day versus a logical decision of what it will look like next to something else on a particular wall. Last month my wife and I drove to Austin, Las Vegas and So-Cal for shows three weekends in a row. They happened to be very good shows with an international following, but yes I love the travel in between. It helps that my wife is a great traveling companion and drives while I sleep. The shows are a great way to get my work in front of people, but yes I do love the travel part too. I love observing the everyday life of others and have a much more positive view of people when I travel. I have come to realize that today’s news media, education, TV and online entertainment presents a very edited, slanted and politicized view of society. Traveling is a great reset button for the mind. What do you find more rewarding: Commissioned art pieces for happy clients or the random scratchings from your imagination that you sell on your site? Both are rewarding, but people’s reaction is always the real reward. When a client has high standards and confidence in their field of expertise, they tend to respect the abilities of others and will treat a project as if it’s a given that what you create for them will be great. Creating great work for great clients is its reward. Likewise, when I create a personal piece and then offer prints for sale, I’m always interested to see who likes it. I’ve come to like my customers — not because they gave me money but because they can articulate better than I can why they want something I did. Speaking of commissions, do you have to turn some down due to time constraints or are you pretty quick with that X-Acto? My professional background has given me the ability to think of cool ideas pretty quickly. The actual scratching is not as time-consuming as you might think — it’s the back and forth between the client, getting approvals, finding the reference, creating digital files and revising that takes the time. I’m not at the stage yet where I have too much work. As any self-employed artist knows, we sometimes work day and night, day and night, and day and night to get the job done. I know as artists we all have to make a living off of our art, but can you tell me about a piece –regardless of the money– that has been the most rewarding for you, and how so? I have a piece called “Guitar Night” which started as a CD cover that I did for singer/songwriter Matt Armor. Matt introduced himself at a show telling me that he had previously bought a print from me and wanted me to design a cover for his upcoming CD. He sent me some MP3s of a stripped down demo tracks, and I loved his music and the stories he told and was inspired. I did both the front and back covers based on his input and the words to his songs. The record release party was at a club in Santa Barbara, California where he played the songs live with his band. The club had around 20 video screens throughout the rooms and Matt had asked me to put as many of my art pieces on a DVD as I wanted and that ran on all 20 screens while he played. It brought my art to life in a cool multi-media way and was a huge confidence booster for pushing my art to new levels. So when you get a commission piece, do you like a lot of direction from the client, or do you prefer to get a few key ideas from them and then do your thing? I’ve had lots of good clients, but the ones who bring out the best in me are the ones who love what I do and are 100% convinced I’m going to do a great job and are ready to buy whatever I do without changes. The pressure is almost too much. I work so hard to live up to their high expectation they don’t even know. I’m not a fan of clients who say “do whatever you want.” Because that usually means “do what you want, and then I’ll give you my opinion and want to change it.” I want to hear what their objective is — who they want to target. When I know what they are passionate about — what they like and what they’ve already thought about — it opens me up to all kinds of ways to express ideas they will probably like. How is your Scratch This book sales going? Do you find it hard to sell a book of your art when there’s so much of your artwork posted and shared online? Do you plan on any additional books or DVDs in the future? That’s an interesting observation about art shared online reducing the demand for a book. I hadn’t thought about that before. My son is 26, and his whole world is on one device — business and personal. His iPhone seemingly unclutters his life and all his entertainment, reference, information, and inspiration are in one place. On one level why would he want a book of art when he can see it online? On the other hand, I like vinyl records and art books, so maybe books fill the need for those who need a tactile art experience. When I created my book, I wanted to write about inspirations, experiences, technique, etc. for each piece rather than create a book of pictures with no words. It was partly a way for me to journal and to remember what I have done during the last six years before I forget. It’s been available on my website, and I offer it at the shows I vend at. Sales at first were good and mostly to people who were already familiar with my art. But now that you mention it, sales have slowed one year later while at the same time bookstores are closing so maybe there’s something to people not needing books anymore. Even still, I will do another book for the same reasons I did the first one — mostly to document my experience and track my progress. There will always be those who want a more complete story in one place than random bits on the Internet. 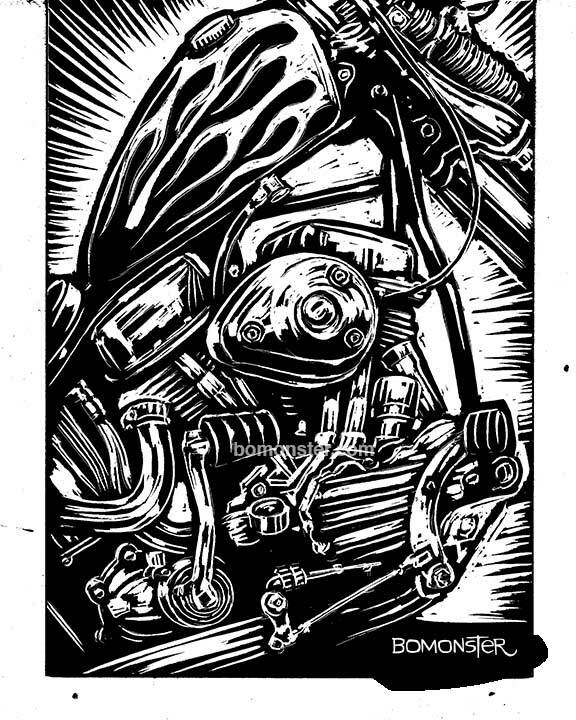 There was an artist I wanted to feature in the magazine, but they were unwilling to send high-resolution art files to me for print publication because of being burned too many times by people using those high-resolution art files for making counterfeit posters and apparel. Have you had any issues like that with your work and how have you handled it? They bring up a good point. And I have thought the same thing when asked for high res images. Early on I voiced that same concern to artist Max Grundy, and he said that if we didn’t put ourselves out there, no one would ever discover our work. Our job as artists is to get our work out there as fast as we can to as many people as possible, so everyone knows whose work it is. Then if someone counterfeits it, others will bring it to our attention knowing who the original artist is. The Internet is both good and bad for all artists. It devalues art and music to a public commodity and makes people think it’s all free because it’s online. But it’s also good for exposure, and it’s the way most people interact with the world and each other, like it or not. The key is to make it work for us but point people to a way to buy. You can’t be just the artist if you want to pay the bills with your art. You have to be the marketer and retailer too and be brave enough to accept the risks. Johan Werner from Factory68.com in Germany stole nearly every image from my website and made severely pixelated small stickers for sale at the huge Essen Motor Show in Germany. It was brought to my attention by two Kustom culture fans there, and I sent emails to both him and the Essen motor show promoters. When I didn’t hear back I wrote a funny blog about his name “Factory 68” and that he named it that because he steals from 68 different artists. My blog post (http://bomonster.com/blog/page/14/) got cut and pasted by a couple of huge blogs worldwide, and I heard Johan was told by Essen that he could only sell that year but was not invited back. If you Googled his name a week later, every entry had my words slamming him since Google pulls from multiple sources. 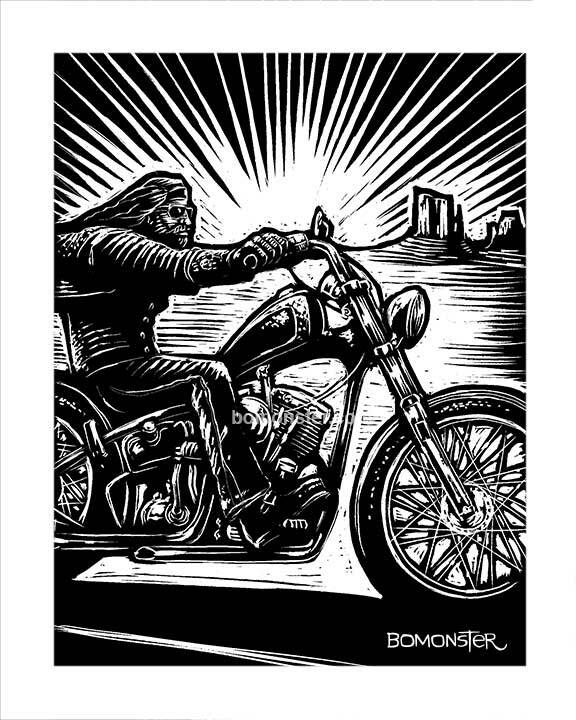 He must have wondered who is BOMONSTER and what kind of power does he wield? 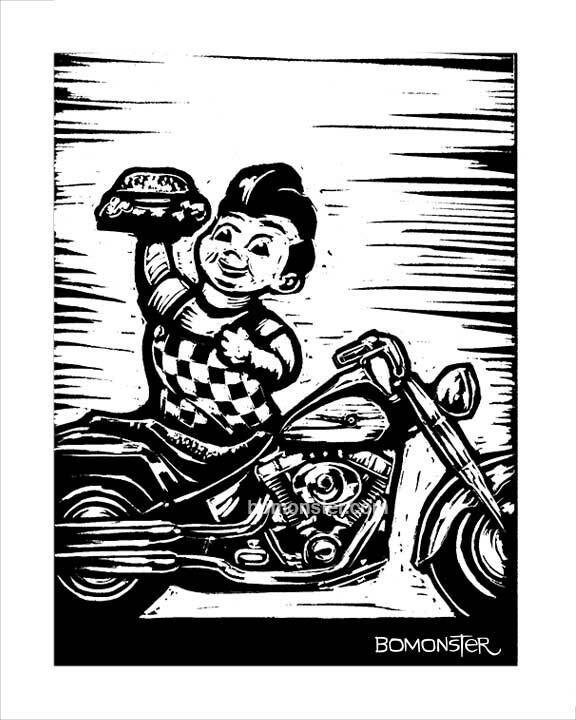 What would you tell the younger BOMONSTER about making a career out of Kustom Kulture art? In some ways, I wish that I had started earlier so I would be farther along in my development as an artist so I could give my younger self some advice. But waiting as long as I have to get started has allowed me to tap into my own life experiences and has given me the experience to know what’s already been done to death and to recognize originality when I stumble upon it. What I will tell other younger selves though is not to be afraid to put yourself out there with your work. Create, scan, print, make a website, post on Facebook but don’t stop there. By going public, you will connect with others who get what you do. From there, opportunities will present themselves. You will also feel slight guilt over the compliments to your work knowing you see all the flaws. That alone will make you work harder to deserve the compliments and make you a better artist. What I also like about starting later in my career is that it is all new to me — I’m a long, long ways from being the crusty old jaded artist who’s seen it all, done it all. ... 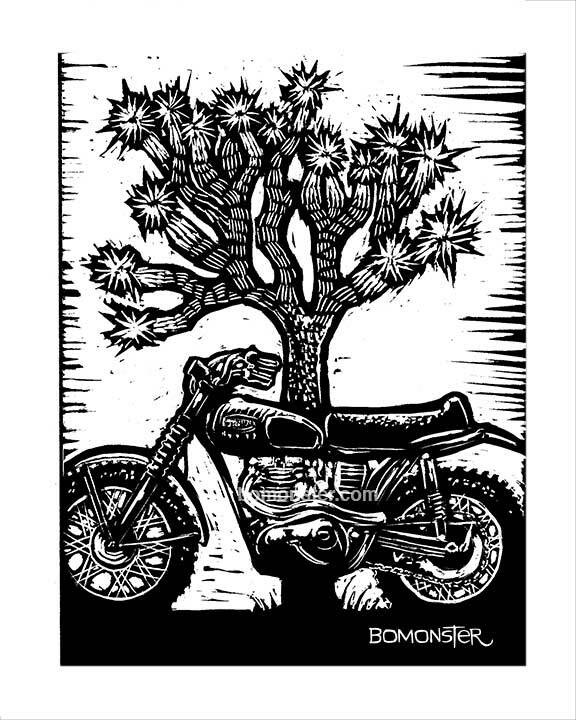 Check out BOMONSTER online at www.BOMONSTER.com, and give him a follow on Facebook and Instagram. Love em all , but the first is the ultimate pic . wicked cool! whats the deal on the book?